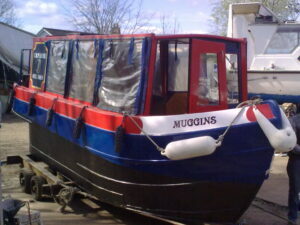 Our very popular 26 ft narrow boat with forward steering, seating a maximum of 12 persons. 6 ft. headroom throughout, heating by large radiator utilising waste heat from the engine. Small sink, electic kettle supplied for coffee and tea, Sink, (bring your own cups and makings). 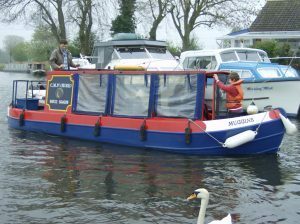 The transparent side screens can quickly be rolled up in fine weather or secured down to provide weather protection for all year round cruising. This is a fun boat, ideal for family outings, office parties, children’s birthday parties or just a few friends together for a fun day out.